Idiopathic dilated cardiomyopathy (DCM) is responsible for ∼25% of all cases of congestive heart failure. We have recently shown that immunization of autoimmune-susceptible SWXJ mice with whole cardiac myosin leads to T cell-mediated experimental autoimmune myocarditis (EAMC) and DCM. We have now identified two disease-inducing peptides from cardiac α-myosin heavy chain (CAMHC). Our approach involved the use of a novel MHC class II-binding motif contained in several peptides known to be immunogenic in SWXJ (H-2q,s) mice or in the parental SJL/J (H-2s) or SWR/J (H-2q) mouse strains. Two of four CAMHC peptides containing the -KXXS- peptide motif were found to be immunogenic. Immunization of SWXJ or parental SJL/J and SWR/J mice with CAMHC peptides pα406–425 or pα1631–1650 resulted in EAMC and DCM, characterized by inflammation, fibrosis, and decompensated right-sided ventricular dilatation. Despite mediating high incidences of severe disease, both peptides were found to be cryptic determinants, thereby providing further evidence for the importance and perhaps predominance of self crypticity in autoimmunity. Both peptides showed dual parental I-Aq and I-As restriction and mediated passive transfer of disease with activated CD4+ T cells. An intact motif was necessary for antigenicity because loss of activity occurred in peptides containing nonconservative substitutions at the motif’s terminal lysine and serine residues. Our studies provide a new model for EAMC and DCM in strains of mice widely used in autoimmune studies. Moreover, the -KXXS- motif may be particularly useful in implicating previously overlooked proteins as autoimmune targets and in facilitating the development of new organ-specific autoimmune mouse models for human diseases. Dilated cardiomyopathy (DCM)5 is a syndrome characterized by dilatation of the ventricular chambers on one or both sides of the heart. Accompanying this dilatation is a concomitant loss of myocyte contractility that often leads to decreased cardiac output and large-scale multiorgan failure (1). It is well established that immune-mediated myocarditis may provide the inciting etiopathogenic event leading to DCM. Myocarditis may be induced experimentally by several methods, including immunization with protein (2) or protein fragments (3, 4, 5) derived from cardiac myosin or infection with cardiotropic viruses (6, 7, 8). Recently, we have shown that immunization with xenotypic porcine cardiac myosin with 90% homology with murine cardiac myosin results in experimental autoimmune myocarditis (EAMC) and DCM in SWXJ mice expressing the H-2q,s hybrid haplotype of the SWR/J (H-2q) and SJL/J (H-2s) parental strains (9). In the current study, we have identified disease-inducing peptides of cardiac myosin by using a novel sequence-binding motif for I-Aq and I-As class II molecules. We focused our attention on cardiac α-myosin heavy chain (CAMHC) because it is the predominant protein expressed in the adult murine heart (10, 11) and because several studies have shown that the α-chain is more immunogenic than the highly homologous cardiac β-myosin heavy chain (CBMHC) (12, 13). However, the 1939-aa sequence of CAMHC (14, 15) precluded using the traditional approach of epitope mapping with overlapping peptides to identify immunogenic sequences. Instead, we selected candidate CAMHC peptides that met the following criteria: 1) each peptide contained a -KXXS- amino acid motif common to several MHC class II-restricted peptides shown to induce autoimmune disease in SJL/J (H-2s) and/or SWR/J (H-2q) mice (16, 17, 18), the parental strains of our hybrid SWXJ (H-2q,s) mice; and 2) the homologous peptide sequence in the relatively nonimmunogenic CBMHC showed marked primary sequence disparity and/or did not contain the -KXXS- motif. Our selection criteria yielded four candidate 20-mer CAMHC peptides, and two of them proved to be disease-inducing immunogens. Immunization of SWXJ mice or either of the SJL/J or SWR/J parental strains with pα406–425 KVGNEYVTKGQSVQQVYYSI or pα1631–1650 LSQANRIASEAQKHLKNSQA resulted in CD4-mediated EAMC and DCM. Because we found that an intact -KXXS- motif was necessary for antigenicity, our results indicate that the -KXXS- class II-binding motif represents an effective way to predict disease-inducing sequences of self proteins capable of mediating organ-specific disease in the widely used autoimmune susceptible SJL/J, SWR/J, and SWXJ mouse strains. SWXJ (H-2q,s) mice were generated by mating SJL/J (H-2s) males with SWR/J (H-2q) females at The Jackson Laboratory (Bar Harbor, ME). At 6–10 wk of age, mice were injected s.c. in the abdominal flank with 200 μg of peptide and 400 μg Mycobacteria tuberculosis H37RA (Difco, Detroit, MI) in 200 μl of an emulsion of equal volumes of water and IFA (Difco). In experiments involving disease induction, each mouse also received an i.v. injection on day 0 with 2.0 μg of purified Bordetella pertussis toxin (List Biological Labs, Campbell, CA). Mice were euthanized by asphyxiation with CO2, followed by cervical dislocation. All protocols were approved by the Institutional Animal Care and Use Committee in compliance with the Public Health Service policy on humane care and use of laboratory animals. All peptides were synthesized by the Molecular Biotechnology Core Facility of the Lerner Research Institute using standard solid-phase methodology and 9-fluorenyl-methoxycarbonyl side chain-protected amino acids. Peptides were purified >97% by reverse-phase HPLC, and amino acid composition was confirmed through mass spectroscopy. Synthesized peptides were derived from the published sequence of murine cardiac α- and β-myosin heavy chain isoforms (14, 15). To determine peptide immunogenicity, lymphocytes were isolated from lymph nodes (LN) 10 days after immunization. Draining inguinal and axillary LN were removed and teased into single cell suspensions, washed three times in HBSS (Life Technologies, Grand Island, NY), and cultured in 96-well flat-bottom microtiter Falcon plates (BD Labware, Franklin Lakes, NJ) at 3 × 105 cells/microtiter well in DMEM (Mediatech CellGro, Herndon, VA) supplemented with 10% FBS (HyClone, Logan, UT), 5% HEPES buffer, 2% l-glutamine, and 1% penicillin/streptomycin (Life Technologies). Synthetic peptides were added in serial 10-fold dilutions to triplicate wells with positive control wells containing 2 μg/ml anti-mouse CD3 (BD PharMingen, San Diego, CA) or 20 μg/ml M. tuberculosis H37RA. Negative control wells contained no Ag or various doses of peptide p139–151 of myelin proteolipid protein 139–151, an immunogenic peptide that induces experimental autoimmune encephalomyelitis (EAE) in SJL/J mice (19). Cells were cultured at a final volume of 200 μl/well. To measure recall responses to immunogenic peptides, spleens were removed 8–9 wk after immunization, and lymphocytes were enriched by centrifugation for 15 min at 2400 rpm on a Ficoll gradient containing 14% Ficoll (Sigma-Aldrich, St. Louis, MO) and 32% sodium metrizoate (Accurate Chemical Scientific, Westbury, NY). Mononuclear cells were collected at the interface, washed twice in HBSS, and cultured in 96-well flat-bottom Falcon plates, as described above. All cell cultures were incubated at 37°C in humidified air containing 5% CO2. After 96 h of culture, wells were pulsed with methyl-[3H]thymidine (l.0 μCi/well, sp. act. 6.7 Ci/mmol; New England Nuclear, Boston, MA). Sixteen hours after pulsing, cultures were harvested by aspiration onto glass fiber filters. Levels of incorporated radioactivity were determined by scintillation spectrometry. Results are expressed as mean cpm of triplicate experimental cultures with Ag divided by mean cpm of cultures without Ag (stimulation index). Ten days after immunization with either pα406–425 or pα1631–1650, CD4+ and CD8+ T cells were positively purified from whole LN cells (LNC) by magnetic bead separation on a MidiMACS cell separator (Miltenyi, Auburn, CA), according to manufacturer’s specifications. Purity of the enriched fractions was determined by analysis on a FACScan flow cytometer using CellQuest software (BD Biosciences, San Jose, CA) and was consistently found to be >95%. MHC restriction was determined by several methods. Primed CD4+ and CD8+ T cells were purified from LNC 10 days after immunization of SWXJ mice with either pα406–425 or pα1631–1650. The purified cells were activated with peptide at 100 μg/ml in cultures containing 2.5 × 105 cells/microtiter well and 5 × 105 gamma-irradiated (2500 rad) splenocyte feeders from SWXJ mice and from parental SJL/J and SWR/J mice. Ag-specific proliferation was determined, as described above. Class II restriction was also performed by measuring proliferation of purified CD4+ T cells from primed LN in the presence of 10 μg/ml of anti-I-As (clone 10-3.6) or anti-I-Aq (clone 25-9-17) purchased commercially (BD PharMingen). Mouse cardiac myosin was purified from Swiss Webster white mouse hearts purchased commercially (Pel-Freez, Roger, AR). Myosin purification was performed, as previously described (20). Briefly, hearts were minced and homogenized in Hasselbach-Schneider solution containing 0.3 M KCl, 0.15 M K2HPO4, 0.01 M Na4P2O7, and 1.0 mM MgCl2 at pH 6.8. The solution was stirred and centrifuged, and the supernatants were precipitated overnight in a 20-fold volume excess of H2O. The myosin was collected by centrifugation at 12,000 × g for 10 min; resuspended in 0.3 M KCl, 0.01 M imidazole, 5.0 mM MgCl2, and 5.0 mM Na2ATP buffer at pH 6.8; and recentrifuged to remove actin. The myosin protein was precipitated by the addition of an 8-fold volume excess of H2O, and the precipitate was resuspended in 0.3 KCl, 0.01 M imidazole buffer at pH 6.8. After centrifugation, the supernatant was diluted with a 6.5-fold volume excess of H2O, allowed to stand for 1 h, and centrifuged. The pellet was redissolved in 0.5 M KCl, 0.01 M imidazole buffer at pH 6.8, and the purity of each myosin preparation was determined by gel analysis using 7.5% SDS-PAGE and Coomassie brilliant blue. Male SWXJ mice 6–8 wk old were immunized with either pα406–425 or pα1631–1650, as described above, but without Bordetella pertussis adjuvant. Ten days later, inguinal and axillary LNC were cultured with 20 μg/ml Ag at 5 × 106 cells/ml in 24-well flat-bottom Falcon plates (BD Biosciences) in a total volume of 2.0 ml/well in DMEM supplemented as described above. After 4 days of activation with Ag, cells were washed thoroughly, and 2–4 × 107 cells were injected into the tail veins of naive gamma-irradiated (450 rad) SWXJ recipients. At 8–9 wk following transfer, hearts were examined for histopathologic changes, and recall responses to priming immunogens were assessed by proliferation and cytokine ELISAs. Thirty minutes before euthanasia, mice were injected i.p. with 100 U heparin (Elkins-Sinn, Cherry Hill, NJ) to prevent postmortem clotting. After euthanasia, hearts were removed, perfused with PBS, and fixed in Formalin overnight. After paraffin embedding, two to three serial 5-μm cross sections were obtained from the apex of the heart, thereby showing cross sections of the left and right ventricles. Heart sections were stained with either H&E or Masson’s trichrome and examined by light microscopy for the presence of inflammation or fibrosis, respectively. The percentage of heart tissue involved in inflammation was determined in a blinded manner by an investigator who was unaware of the tissue source at the time of analysis. Criteria for the presence of dilated cardiomyopathy included: 1) presence of fibrotic tissue; 2) marked ventricular dilatation, i.e., an increase in the radius of one or both ventricular chambers without a proportionate increase in mural wall thickness; and 3) increase in the heart weight:body weight ratio calculated by dividing the heart weight in milligrams by the body weight in grams. Sections taken from brain, liver, and soleus skeletal muscle were similarly processed and evaluated for the presence of inflammation and fibrosis. Cytokine concentrations were determined by ELISA measurement of supernatants of primed lymphocytes cultured in supplemented DMEM for 48 h at a concentration of 5 × 106 cells/well in 24-well flat-bottom Falcon plates (BD Biosciences). Stimulating Ag was added at a concentration of 20 μg/ml in a final volume of 2.0 ml/well. Purified capture/detection Ab pairs and recombinant cytokines were obtained commercially (BD PharMingen). Capture/detection Ab pairs included anti-mouse IFN-γ (R4-6A2 and biotin XMG1.2), anti-mouse IL-2 (JES6-1A12 and biotin JES6-5H4), anti-mouse IL-4 (BVD4-1D11 and biotin BVD6-24G2), anti-mouse IL-5 (TRFK5 and biotin TRFK4), and anti-mouse IL-10 (JES5-2A5 and biotin SXC-1). Absorbance was measured at 405 nm using a model 550 ELISA microplate reader (Bio-Rad, Hercules, CA). Standard values were plotted as absorbance vs cytokine concentration, and sample cytokine concentrations were determined as values within the linear part of the standard curve established using known concentrations of each cytokine. We addressed the issue of identifying disease-inducing sequences of cardiac myosin. We focused on CAMHC because of its predominance in the adult murine heart (10, 11) and its high immunogenicity (12, 13). However, conventional epitope mapping with overlapping peptides seemed rather formidable because ∼400 20 mers would have to be synthesized to represent the entire CAMHC primary sequence of 1939 aa (14, 15). We were able to bypass conventional epitope mapping by observing that a number of class II-restricted T cell epitopes activating CD4+ T cells from SJL/J and/or SWR/J mice contained a 4-aa -KXXS- sequence motif in which 2 irrelevant aa separate a lysine or conservatively substituted arginine residue for a serine residue (16, 17, 18) (Table I⇓). Thus, we postulated that -KXXS- or -RXXS- sequences may represent a binding motif for MHC class II molecules expressed in SWXJ mice, namely I-As and I-Aq. We next synthesized four peptides from two regions of mouse CAMHC that contained the proposed binding motif and also had complementary sequences in CBMHC that did not contain the binding motif and/or had substantial sequence disparity (Table II⇓). Individual SWXJ female mice were immunized with each of the four selected peptides, and the primed LNC were tested for their ability to proliferate in response to each immunogen. We found that substantial recall responses were elicited from primed LNC in response to pα406–425 and pα1631–1650, but not in response to the overlapping peptides pα628–647 and pα630–649 (Fig. 1⇓a). Analysis of 48-h supernatants from peptide-activated cultures showed that the response to pα406–425 and pα1631–1650 was characterized by a predominant Th1-like phenotype with high production of IFN-γ and IL-2 and minimal production of IL-4 and IL-5 (Fig. 1⇓b). Immunogenicity of CAMHC peptides containing the -KXXS- MHC class II-binding motif. Male SWXJ mice were immunized with selected CAMHC peptides containing the -KXXS- motif. Ten days after immunization, LNC were tested for recall proliferative responses to each peptide immunogen. 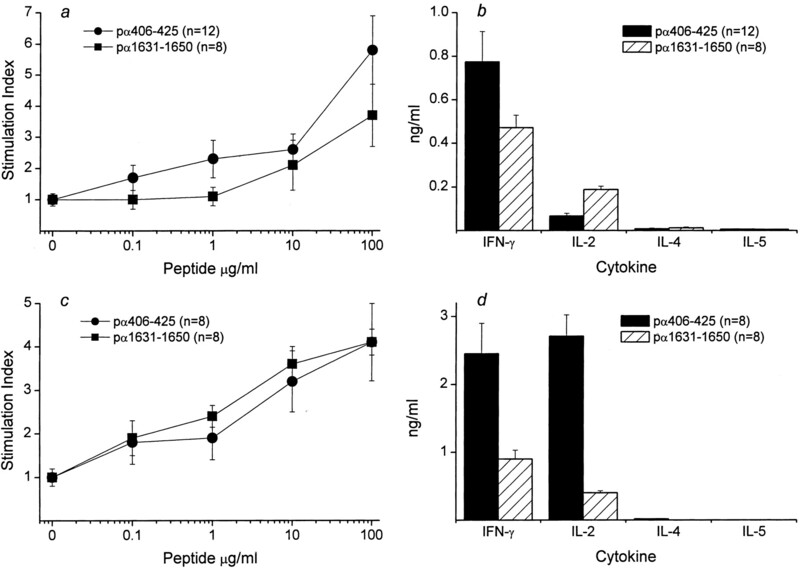 a, Peptides pα406–425 and pα1631–1650 elicited marked dose-response reactivity, whereas the overlapping peptides pα628–647 and pα630–649 were relatively nonimmunogenic. b, ELISA analysis of culture supernatants showed that responses to pα406–425 and pα1631–1650 were characterized by proinflammatory Th1-like cytokine profiles with high level production of IFN-γ and IL-2 and virtually no production of IL-4 and IL-5. Error bars show ±SE. To determine whether the immunogenic pα406–425 and pα1631–1650 peptides were capable of inducing EAMC and DCM, we actively immunized male SWXJ mice with each peptide and assessed disease induction by gross examination and histologic analysis of hearts 8 wk later. In addition, the ability to passively transfer disease was evaluated by adoptive transfer of peptide-activated LNC from primed mice into naive recipients. Our results showed that pα406–425 induced EAMC and DCM with combined active and passive incidences of 75 and 63%, respectively, whereas pα1631–1650 induced EAMC and DCM with somewhat lower combined incidences of 57 and 40%, respectively (Table III⇓; Fig. 2⇓). Active and passive induction of EAMC and DCM with pα406–425 and pα1631–1650. Hearts from normal 14-wk-old male SWXJ mice show no signs of ventricular dilatation (a), inflammatory infiltrates (d), or fibrosis (g). 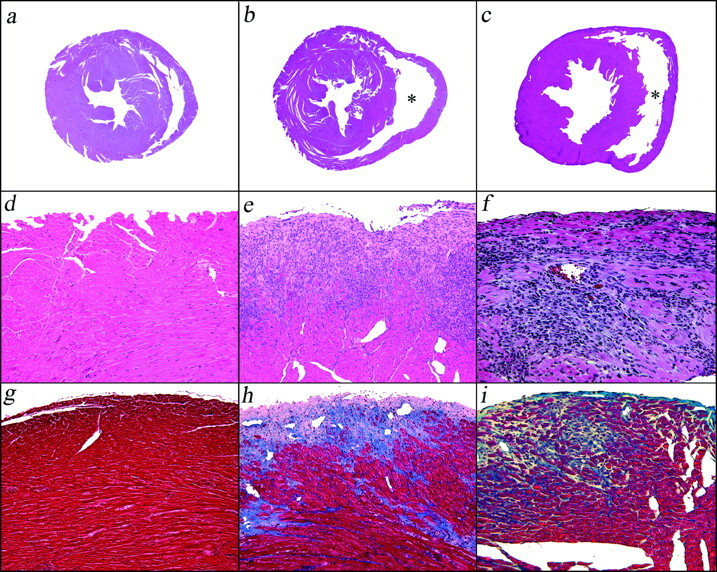 In contrast, 8 wk after immunization of male SWXJ mice with pα406–425, hearts showed ventricular dilatation (b) (∗), parenchymal infiltration of mononuclear cells (e), and fibrotic damage (h). Similarly, 8–9 wk after adoptive transfer of 2–4 × 107 activated pα1631–1650-specific LNC, hearts showed ventricular dilatation (c), inflammation (f), and fibrotic changes (i). Sections are representative of similar tissue damage observed following active or passive induction of disease with either immunogenic peptide. Magnification = ×40 for a–c; ×100 for d, e, g, and h; and ×160 for f and i. Ventricular dilatation and inflammation were assessed in sections stained with H&E, whereas the presence of tissue fibrosis was determined in trichrome-stained sections. Inflammatory infiltrates or fibrotic changes were not observed in multiple sections examined from brain, liver, and soleus skeletal muscle (data not shown). Affected hearts showed an overall increase in size, as indicated by significant increases in heart weight:body weight ratios whether disease was actively or passively induced with either peptide. Hearts showed gross white discoloration due to the presence of inflammatory foci along the pericardium (Fig. 2⇑, e and f), and dissection of the myocardium revealed delicate, floppy myofibers due to right-sided ventricular dilatation (Fig. 2⇑, b and c). Affected mice showed hepatomegaly and splenomegaly, with histologic evidence of centrilobular congestion indicative of right-sided cardiac impairment. The histopathologic findings correlated strongly with the observed clinical signs in affected mice. Cross sections through heart ventricles showed clusters of inflammatory foci occurring most frequently in the pericardium surrounding the right ventricle (Fig. 2⇑, e and f). Inflammatory infiltrates were readily apparent and were specific for cardiac tissue because infiltration was not evident in multiple sections examined from brain, liver, and soleus skeletal muscle (data not shown). The lack of skeletal muscle infiltration is not surprising in light of the substantial sequence disparity between the immunogenic CAMHC peptides and their homologous skeletal myosin sequences (21). DCM was readily apparent in 10 of 16 mice with pα406–425-induced EAMC and in 6 of 15 mice with pα1631–1650-induced disease (Table III⇑; Fig. 2⇑, b and c). Cross sections of ventricles showed marked dilatation (Fig. 2⇑, b and c) and fibrotic tissue damage (Fig. 2⇑, h and i). Taken together, the gross and histologic findings are consistent with an overall appearance of autoimmune-mediated myocarditis and noncompensated ventricular dilatation. We characterized the memory response of mice with EAMC by ex vivo analysis of splenocyte proliferation to pα406–425 and pα1631–1650 8–9 wk after immunization of male SWXJ mice. In each case, splenocytes from EAMC mice elicited recall proliferative responses to the priming immunogen (Fig. 3⇓a). ELISA analysis of culture supernatants showed that responses were consistent with a Th1-like phenotype with elevated recall production of IFN-γ and IL-2, but not IL-4 and IL-5 (Fig. 3⇓b). Similarly, 8–9 wk after adoptive transfer of 2–4 × 107 peptide-activated LNC, splenocytes from EAMC mice showed immunogen-specific proliferative responses (Fig. 3⇓c) and a Th1-like cytokine phenotype (Fig. 3⇓d). Recall responses to pα406–425 and pα1631–1650 in mice with EAMC and DCM. Eight to nine weeks after immunization of male SWXJ mice with either pα406–425 or pα1631–1650, splenocytes from EAMC mice showed a, recall proliferative responses to the priming immunogen characterized by b, a Th1-like cytokine profile with high levels of IFN-γ and IL-2 and virtually no IL-4 and IL-5 in culture supernatants of peptide-activated splenocytes. Similarly, 8–9 wk after adoptive transfer of 2–4 × 107 peptide-activated LNC, splenocytes from EAMC mice showed immunogen-specific proliferative responses (c) and a Th1-like cytokine phenotype (d). Error bars show ±SE. We assessed the relative immunodominance of pα406–425 and pα1631–1650. Immunodominant peptides elicit recall responses following immunization with whole protein, and when used as immunogens induce recall responses to the intact protein. In contrast, cryptic peptides do not elicit recall responses following immunization with the whole protein, and when used as immunogens do not induce recall responses to the intact protein (22). To determine the immunogenic features of pα406–425 and pα1631–1650, we immunized female SWXJ mice with each peptide and with mouse cardiac myosin and then measured the proliferative responses to the peptide immunogens and to the intact protein 10 days later. LNC from mice primed with either pα406–425 (Fig. 4⇓a) or pα1631–1650 (Fig. 4⇓b) responded to each immunogen, but were unable to respond to intact mouse cardiac myosin. LNC from mice primed to whole cardiac myosin showed recall responses to cardiac myosin, but were unresponsive to each peptide (Fig. 4⇓c). Thus, our results show that pα406–425 and pα1631–1650 are nondominant, cryptic peptide Ags of mouse cardiac myosin. Crypticity of pα406–425 and pα1631–1650. The cryptic nature of the response to pα406–425 and pα1631–1650 in female SWXJ mice was determined by evaluating the ability of peptide-primed LNC to respond to whole mouse cardiac myosin and by determining the ability of myosin-primed LNC to respond to each peptide. LNC from mice primed to either pα406–425 (a) or pα1631–1650 (b) responded to each priming peptide, but were unable to respond to the intact molecule. LNC from mice primed to mouse cardiac myosin (c) showed recall responses to whole cardiac myosin, but were unresponsive to each peptide. Error bars show ±SE. We next characterized the MHC restriction elements involved in responses to pα406–425 and pα1631–1650. Ten days after immunization of female SWXJ mice with either pα406–425 or pα1631–1650, CD4+ and CD8+ T cells were positively purified from whole LNC by magnetic bead separation (>95%) and tested for reactivity to each peptide immunogen at 100 μg/ml. Compared with whole LNC, the CD4+-enriched population showed enhanced proliferation to each peptide, whereas CD8+-enriched cells showed markedly diminished autoreactivity (Fig. 5⇓a). Treatment at initiation of peptide-activated cultures with 10 μg/ml of Ab specific for I-As or I-Aq resulted in diminished responsiveness to each peptide, indicating that primed CD4+ T cells responded to both peptides in a dual I-As- and I-Aq-restricted manner (Fig. 5⇓b). The dual MHC restriction was confirmed by testing responses of parental SJL/J and SWR/J mice primed to each peptide. Ten days after peptide immunization, splenocytes from parental SJL/J and SWR/J mice responded to each peptide in a manner that was similar to responses obtained from SWXJ mice (Fig. 5⇓c). Although responses appeared to be somewhat enhanced in the SWR/J (H-2q) strain compared with the SJL/J (H-2s) mouse (Fig. 5⇓, b and c), these differences were not significant in our study. Final verification of the dual parental I-As and I-Aq restriction for each peptide occurred when we found that each peptide induced EAMC and DCM in both parental SJL/J and SWR/J mouse strains (data not shown). Dual parental I-Aq and I-As restriction of CD4+ T cell responses to pα406–425 and pα1631–1650. Ten days after immunization of female SWXJ mice with either pα406–425 or pα1631–1650, CD4+ and CD8+ T cells were positively purified from whole LNC by magnetic bead separation (>95%) and tested for reactivity to each peptide immunogen. a, Compared with whole LNC, the CD4+-enriched population showed enhanced proliferation to each peptide, whereas CD8+-enriched cells showed markedly diminished reactivity. b, Treatment with Abs to either I-As or I-Aq resulted in diminished responsiveness to each peptide. c, The dual I-As and I-Aq MHC class II restriction for each peptide was confirmed because splenocytes from peptide-primed parental SJL/J and SWR/J mice showed proliferative responses similar to those from primed hybrid SWXJ mice. In all experiments, n = 4. All test cultures contained peptide at 100 μg/ml. Error bars show ±SE. We next examined the motif’s sequence requirements for antigenicity. Ten days after immunization of female SWXJ mice with pα406–425, LNC were tested for responsiveness to the native pα406–425 peptide containing the intact -KGQS- sequence as well as to peptide variants containing substitutions for the terminal lysine and serine residues. As shown in Fig. 6⇓, recall responses were elicited when the -KGQS- sequence remained intact or was replaced by -RGQC- representing two conservative amino acid substitutions, arginine for lysine and cysteine for serine. However, recall responses were not elicited by a peptide containing the nonconservative -GGQG- double substitutions or when the pβ406–425 β-chain homologue containing the -KGQN- nonconservative single substitution was used to test recall responses. Our results indicate that peptide antigenicity requires an intact -KXXS- sequence or a sequence containing conservative amino acid substitutions for the terminal lysine and serine residues. An intact -KXXS- motif is required for peptide antigenicity. Ten days after immunization of male SWXJ mice with pα406–425, LNC were tested for responsiveness to the native pα406–425 peptide containing the intact -KGQS- sequence as well as peptide variants containing substitutions for the lysine and serine residues. Recall responses were elicited when the -KGQS- sequence remained intact or was replaced by -RGQC- representing 2 conservative aa substitutions. Recall responses were not elicited when the native -KGQS- motif was replaced by the nonconservative -GGQG- double substitutions or when the pβ406–425 β-chain homologue containing the -KGQN- nonconservative single substitution was used to test recall responses. Error bars show ±SE. In the present study, we identified an MHC class II-binding motif capable of predicting CAMHC peptides that target severe cardiac-specific autoimmune disease in SWXJ mice and in the parental SJL/J and SWR/J mouse strains. Application of the -KXXS- motif successfully pinpointed pα406–425 and pα1631–1650 from a total of four peptides selected from the large 1939-aa sequence of CAMHC. The importance of this finding lies in the fact that a simple 4-aa peptide motif may be used to identify immunogenic peptides of self proteins in strains of mice widely used in autoimmune studies. SJL/J and SWR/J mice are particularly susceptible to EAE, an animal model for multiple sclerosis, and peptides from several myelin proteins have been shown to induce EAE (23). In at least two cases, a single peptide has been shown to induce EAE in both SJL/J and SWR/J mice. Myelin basic protein 87–99 VHFFKNIVTPRTP and proteolipid protein 104–117 KTTICGKGLSATVT are encephalitogenic determinants in SJL/J and SWR/J mice as well as in their SWXJ F1 hybrid strain (16, 24, 25, 26). Thus, the dual parental immunoreactivity observed in the current study in response to pα406–425 and pα1631–1650 may be common in SJL/J and SWR/J mice and may provide enhanced responsiveness to a given immunogen in SWXJ hybrids, perhaps as a result of the combined responses of parental I-As- and I-Aq-restricted T cell repertoires, as has been shown (16). The nondominant, cryptic nature of the pα406–425 and pα1631–1650 peptides is a common trait of self Ags, presumably because it is more difficult to achieve tolerance to nondominant determinants compared with immunodominant epitopes (27), and because there is an efficient thymic deletion of the high affinity autoreactive T cell repertoire responding to immunodominant peptides (28, 29). Indeed, positive selection of autoreactive T cells responding to immunodominant self determinants is often the apparent result of unusual circumstances such as failed thymic capture of immunodominant peptides having extremely low affinities for MHC molecules (30) or failed thymic expression of protein isoforms containing immunodominant peptides (31, 32). It is widely believed that the relatively high immunogenicity of CAMHC compared with CBMHC may be due to the fact that the CAMHC α-isoform is predominantly expressed postnatally, thereby avoiding the ontogenic window of thymic medullary negative selection that begins at about day 11 of gestation in mice (4). In contrast, the CBMHC β-isoform is expressed predominantly during embryogenesis (10, 11), coincident with thymic negative selection. Nevertheless, the cryptic nature of the pα406–425 and pα1631–1650 peptides does not prevent them in any way from inducing a high incidence of active and passive EAMC and DCM, thereby providing further support for the importance and perhaps predominance of self crypticity in autoimmunity. Indeed, recent studies by Brehm et al. (33) indicate that cryptic determinants from one virus may become immunodominant when engaged following prior exposure to another virus containing a distinct, but cross-reactive cryptic epitope. Therefore, it is quite conceivable that ordinarily cryptic cardiac myosin epitopes may become immunodominant after repertoire shaping by environmental or age-related events. In addition, others have shown that progression of autoimmune disease may be associated with the accumulation of cryptic self recognition (34), Thus, crypticity may provide the basis for initiation of autoimmunity following postviral repertoire shaping and may serve as a way to maintain chronic inflammation directed against self during progression of autoimmune disease. Prior models for EAMC and DCM have been developed primarily in C3H or A/J mice expressing the H-2k haplotype or BALB/c mice expressing the H-2d haplotype. Thus, the current study provides a new murine model for EAMC and DCM in a genetic background previously unexplored for this disease. Moreover, along with EAE, it provides the novel availability of at least two different inducible organ-specific autoimmune diseases within the same mouse strain. This latter feature may be particularly useful in sorting the underlying basis for autoimmune gender biases because a female bias is evident in EAE and multiple sclerosis susceptibility (35, 36), whereas a male bias appears evident in susceptibility to murine EAMC (37) and in the incidence of human idiopathic DCM, a disease that kills males at a 2- to 3-fold greater frequency than females (38, 39, 40). It is clear from our data that not all -KXXS–containing peptides are immunogenic in SWXJ mice. Conversely, not all SWXJ immunogens contain the -KXXS- motif, as evidenced by the absence of the motif in the highly encephalitogenic myelin basic protein 87–99. 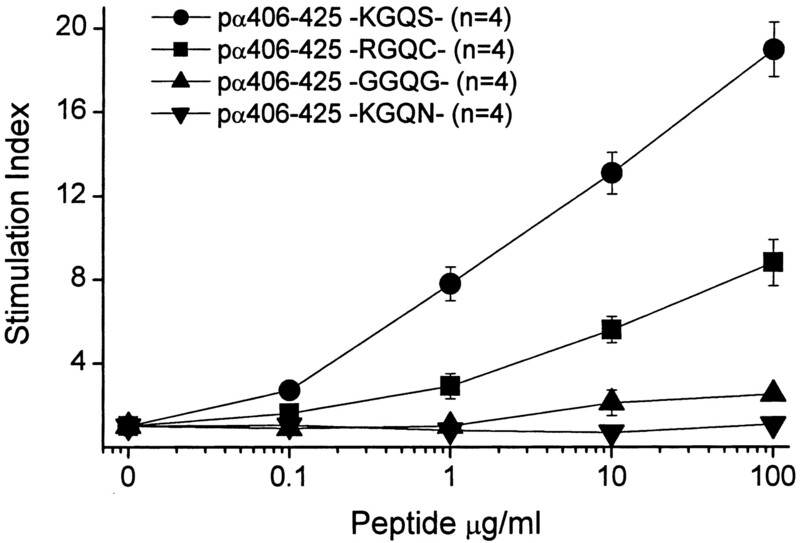 Although the -KXXS- motif is not definitional for I-As- and I-Aq-restricted immunogenicity, it will probably prove to be most useful in predicting immunogenic peptides from previously overlooked self Ags. To date, the sole focus for targeted autoimmune attack against the heart has been cardiac myosin primarily because it is abundantly and exclusively expressed in the heart (10, 11) and because it is highly immunogenic (12, 13). However, there is reason to believe that the pathogenesis of EAMC and DCM may involve other less abundant heart proteins, as has been shown in EAE studies in which the minor myelin constituent myelin oligodendrocyte glycoprotein serves as the apparent immunodominant protein target in C57BL/6 mice (41) and is highly encephalitogenic in SJL/J mice (17). Thus, the -KXXS- motif may be particularly useful in identifying disease-inducing peptides of other proteins expressed predominantly in the heart, such as cardiac troponin T (42), phospholamban (43), and cardiac laminin (44, 45). Finally, the -KXXS- motif may be applied for developing mouse models for putative human autoimmune disease that currently have no satisfactory murine model. This approach may be particularly useful in situations in which there is a limited availability of organ-specific proteins. This appears to be the case in a number of diseases, such as idiopathic granulomatous orchitis (46), chronic abacterial prostatitis (47), and autoimmune sensorineural hearing loss (48). Indeed, we have recently developed an organ-specific autoimmune mouse model for the latter disease using immunogenic -KXXS–containing peptides derived from inner ear-specific proteins (data not shown). Thus, the broad applicability of the -KXXS- motif may be particularly useful in implicating previously overlooked proteins as autoimmune targets and in developing new organ-specific autoimmune mouse models for human diseases. We thank Dr. Thomas Forsthuber for his support and guidance. We also thank Dr. Steven Emancipator for his invaluable and generous advice. ↵1 This work was supported by National Institutes of Health Grants NS-36054, NS-37476, and AI-51837, and by the National Multiple Sclerosis Society Grant RG-3070. ↵2 Current address: Department of Pathology, Marshall University School of Medicine, 1542 Spring Valley Drive, Huntington, WV 25704. ↵3 Current address: Institute of Molecular Cardiobiology, Johns Hopkins University School of Medicine, Baltimore, MD 21205. ↵5 Abbreviations used in this paper: DCM, dilated cardiomyopathy; CAMHC, cardiac α-myosin heavy chain; CBMHC, cardiac β-myosin heavy chain; EAE, experimental autoimmune encephalomyelitis; EAMC, experimental autoimmune myocarditis; LN, lymph node; LNC, LN cell. Wynne, J., E. Braunwald. 2001. The cardiomyopathies and myocarditides. E. Braunwald, and D. P. Zipes, and P. Libby, eds. In Heart Disease Vol. 2: 1751-1806. WB Saunders, New York. Prabhakar, B. S., J. Srinivasappa, K. W. Beisel, A. L. Notkins. 1988. Virus-induced autoimmunity: cross-reactivity of antiviral antibodies with self-components. H. P. Schultheiss, ed. New Concepts in Viral Heart Disease 168-178. Springer-Verlag, Berlin. Lenfant, C. 2000. Morbidity and Mortality: 2000. Chart Book on Cardiovascular, Lung, and Blood Diseases. National Heart, Lung, and Blood Institute, National Institutes of Health, Bethesda, MD, p. 39.